A toy gyroscope seems to be able to defy gravity, all the while having its axis slowly weave its way around a cone-shaped path around a supporting pedestal. Everyone has seen a child's spinning top or gyroscope do these mysterious things. A gyroscope can seem to hang horizontally in space, apparently defying the laws of science and gravity. It's surprising how few people seem to actually understand why it is able to behave in such a way. There are even some web sites, where purported "experts" "explain" this action, but all of those web sites I have seen make enormous errors in their explanations. This page, composed by a Theoretical Physicist, is an attempt to develop some clarity regarding gyroscopes, precession, and the Earth's Precession and Nutation. We will first attempt a simple conceptual discussion, and then consider the sophistication of the math and Physics involved! We will consider a toy gyroscope, as in this schematic drawing, where the unseen supporting pillar is under the right end of the shown gyroscope rotor. We will consider three perpendicular axes, 1, 2, and 3. For simplicity, it is spinning with its spin axis (1) horizontal, in a vertical (downward 3) gravitational field, and where the gyro is supported at one end of the shaft (toward the right, but not shown in our drawing), such that its gravitational weight attempts to rotate it (downward) (in a Moment or Couple) around the other horizontal (2) axis. This presentation was first placed on the Internet in April 1998. It is necessary to think of this in two separate stages, to really understand what happens. And also, it is necessary to know the "right hand rule" in Physics, where if a motion along one axis is perturbed (forced) along another axis, there is a resulting force/torque/Moment around the third (perpendicular) axis, as follows: If you use your RIGHT HAND and first point your (four) fingers in the direction of the (arrow of the) first motion (vector) (to the left in our drawing), and then bend your fingers so that the fingers move toward the direction (vector) of the axis of the perturbing action (gravity, downward in our drawing), your THUMB will then be pointing in the correct direction (of the resulting vector) along the third axis (toward us out of the drawing in our example). This will seem simpler as we give this example. The gyro rotor is spinning such that its (another right hand rule: rotation, fingers curved following the spinning makes the right hand thumb then point in the correct direction [of the vector arrow]) motion is defined as shown, going OUTWARD along axis 1. The weight of the gyro is trying to make it fall, which is a rotational action around axis 2, again right-hand-rule giving an outward direction (toward us). Then we have the outward (1) being perturbed by (2), and again the (first) right hand rule then has our thumb pointing upward, which tells us that something must happen regarding (3) where there is a vector that is upward. Your upward thumb actually then tells you which WAY the "precession" will occur! Since there is really nothing that keeps that torque/Moment from having effect, the gyro (body or frame) quickly accelerates to be precessing at a constant rate. It is usually rather slow. Down below, we will calculate the rate it will precess. Is it obvious that if you would cause the rotor to spin the opposite direction, then the Precession will go the opposite way? And that you can affect the RATE of the precession by the rate of spin you put on the rotor when you released it? Good! THAT is the first part, the MOTION of the precession! We have a precessional action (upward, 3) which now has to act on the spinning rotor (axis 1). We can now examine how and why the gyroscope does not fall down, which turns out to be to another of those darned Right Hand Rule situations! Just in case you might think something magical is happening, it isn't! If you measure the weight on the single support location, which would be half the total gyro weight when it is not rotating (with the other half of its weight supported by your fingers), it actually quickly increases up to the entire weight of the gyro when we have the situation above. No weight "disappeared" or anything like that. No anti-gravity effect exists! The weight of the entire gyroscope just gets transferred to where the single support point is then supporting the entire weight of the whole gyroscope. Even advanced Physics textbooks seem to not mention this second process, where the weight of the gyro is therefore supported without falling. They seem to be satisfied at showing why the precession motion occurs! But now you know even more than that, actually why it seems to defy gravity. And you know that it really does not! The weight force downward on the single point of support is actually that of the entire weight of the gyro, while if the gyro effect was not occurring, only half the weight would be supported there and a second support post (or your fingers) would need to hold the outer end up, to keep it from falling. Now we will explore some mathematical treatment of this situation. Maybe we can first do a "partially-math" approach! If we call the rotational angular momentum of the spinning rotor (a vector) H, we can see that it will be along axis 1 (to the left). We already determined that the gravity/falling effect (vector) is M, which is along axis 2. The actual analysis here involves Calculus, but we can discuss a simpler version of that here. We will now look at a brief interval of time, which we call dt. 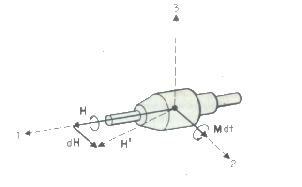 This drawing is showing that, during that brief interval, we have an "angular impulse" of M * dt (along axis 2). Because of the reasoning described above, this angular impulse IS the "perturbing action" which then applies to the initial rotational angular momentum H.
We can "translate" that vector to the left to put it in a location where it will be "added to the vector representing H". We see here that there is therefore a "change in the rotor's angular momentum" (called dH) that is exactly the same size and direction (this has to do with vectors!) as M * dt. We therefore now have a NEW rotational angular momentum vector, shown as H'. This shows us two things. First, we can see that H has to change in a direction toward axis 2 (in this example) so we confirm that we know which direction that precession will occur. Second, we know the value of M, so we can calculate the rate of change of dH with time (or dH/dt), which is another way of calculating the rate of the precessional motion we are about the calculate below. You might think from this simplified discussion that the LENGTH of the H' vector is longer than the H vector was. That is NOT the case! When Calculus is used, the size of dt is made incredibly tiny, and the effect of the very tiny dH then ONLY changes the direction and does NOT affect the length of the H vector. The rotor therefore does NOT either speed up or slow down its spinning as a result. Therefore, the result of all this is that the H vector stays at its constant length, but simply ROTATES in space, twisting the axle of the rotor slowly, smoothly and continuously. THAT is Precession! Our discussion below, and these comments above, are all about the most simple possible example of gyroscopic action. When a gyroscope is at an angle, things are a lot more complicated, and it turns out necessary to use Calculus to calculate dH/dt for more general situations. However, for us here, we intend to keep this as simple as possible, so we are going to only discuss that simplest possible case, where the gyro spin axis is exactly horizontal. If we consider a gyroscope that is not slowing down (no friction) and there are no other external forces (only gravity) acting and the gyroscope is a symmetric body, some of these differential terms are zero and can be ignored. Simplifying this even further, if we consider a gyroscope that is exactly horizontal (gravity being vertical) then our three axes are all perpendicular to each other. Like before, we will call axis 1 as the (horizontal) axis of the gyroscope rotor, axis 2 is the (horizontal) axis around which gravity is trying to make it fall, and axis 3 is the vertical axis. We can see that there are THREE separate terms (on the right) here. If we separate the second and third, we can continue. In our very simplified case, the term (dω2/dt) is exactly equal to the component ω3 * ω1 along the (2) axis. For the simple case of a body (rotor) of symmetry, I2 is equal to I3, and so the first and third terms exactly cancel each other out. This exact match is actually why a horizontal gyroscope is able to hang there, seemingly disobeying gravity! The third term is actually creating its own UPWARD (torque/Moment) vector which exactly matches the first term's downward (torque/Moment) vector due to the pull of gravity on the gyroscope. We then wind up with ONLY the middle term remaining in this differential equation. This allows a great simplification of the original equation to: M2 = I1 * (Ω3) * (ω1). This is usually presented without the subscripts as: M = I * Ω * ω. This is therefore the simplified theoretical equation that describes the rate of precession of a horizontal gyroscope. M is the 'moment' meaning the sideways (along axis 2) moment (or torque) that is trying to change the direction of the horizontal (originally along axis 1) angular momentum vector of the spinning rotor (in other words, the fact that gravity is attempting ot make it fall, and therefore hinge around axis 2). I is something called the 'moment of inertia', a characteristic of the construction of the spinning rotor, ω is the rate of spinning of the rotor, and Ω is the rate of precession that will occur. One additional comment about the Euler equations: Everyone knows that Newton established that Force equals Mass times acceleration, the famous F = ma. In circular motion, in a polar coordinate system, this is described as M = I * α, "Moment" (tangentially acting Force) equals "Rotational Inertia" (the rotating equivalent of Mass) times "Angular acceleration". That might suggest that the equation should actually remain very simple! However, for rotating objects, and for general objects which are rotating in a three-dimensional coordinate system, each of these three terms must be considered as a Vector quantity, having both magnitude (size) and direction. The simple single equation above (for a horizontal gyroscope) is therefore a Vector product of I and α. The rules of Vector multiplication are (sometimes!) different from simple scalar multiplication! If two VECTORS are multiplied together, the result is a Vector which is perpendicular to BOTH of them! In our very simple case, we wind up with Vectors along all three coordinate axes. That is actually called a CROSS PRODUCT, and the multiplication symbol is an x. Vectors can also be multiplied by SCALARS, which still results in a Vector, but now it is in the exact SAME direction as the original Vector was! This is called a DOT PRODUCT and the multiplication symbol is the more familiar (dot) .. Confused yet? The Euler Equations are therefore VECTOR equations, where the various parts are sometimes dot products and other times cross products, and remember, they are DIFFERENTIAL equations, so solving them for any situation more complicated than the very simple example we have been considering involves Vector Calculus. The result is that, in order to actually calculate vector multiplication values (for any situation other than a horizontal gyroscope axis), three separate equations must be considered, along the three axes of the coordinate system. Because of the peculiar characteristics of Cross Products, Vectors with components along all three axes show up all over the place in those equations! This is also why there are THREE Euler equations, to represent the Vector component of the Moment along the three axes. It is also why these components each include terms that depend on factors which are along all three axes. For most situations, the math can get extremely complex! If the gyroscope was tilted at any angle other than horizontal, then there would include terms in all three coordinate directions, for more complicated reasons. We chose a horizontal axis gyroscope in order to keep the math manageable here. Everything discussed here is also true for an angled gyroscope, but the math is MUCH more complicated to understand and to solve. A spinning gyroscope or top is designed with the greatest possible moment of inertia. In the case of a gyroscope, as much of the mass is arranged as far as possible from the axis it will spin on. The laws of physics define moment of inertia for each tiny particle of that object (or any object) as being the product of the mass of that particle times the square of the distance between the particle and the axis of rotation (radius), squared. Therefore, the moment of inertia I = m * r2. The shape of the rotating part of a gyroscope is designed essentially as a ring so that most of the rotating mass (of metal) is very close to R, the maximum radius of the gyroscope. Looking at the equation above, you can see that this would give the maximum total moment of inertia I for the whole object. When this structure is spun, it has angular momentum, also called moment of momentum. Again, from the definitions of Physics, the angular momentum is given by the product of the moment of inertia times the rate of spin. This rate of spin is usually measured as a certain number of radians per second of rotation. A full circle contains 6.28 radians, so an object that is spinning at one revolution per second is rotating at 6.28 radians per second. Note that each of the three Vectors is described as being in a direction that seems to be different from the actual motion involved! That is because the actual quantities being considered are rotational Vectors and not linear ones, and these are each defined as being along the axis of that possible movement. Since our gyroscope is horizontal, the force of gravity is directed straight downward and is equal to the weight of the (whole) gyroscope. Gyroscopes are always designed with the outer frame as light as possible, so we are going to fudge a little here (for simplicity of concept) and say it has no weight. If we would have considered the weight of that framework here, the concept is still exactly the same, but the math gets a little more complicated, that's all. So, the weight of our gyroscope is 0.030 kg * 9.8 m/sec2 [the acceleration due to gravity] or 0.294 kg-m/sec2 or 0.294 newton. We're getting there! Imagine that downward torque applied for a one-second interval. That would mean that we were applying a (torque) moment of 0.01176 newton-meter for one second. Writing this a different way, it is 0.01176 kg-m2/sec. Notice that this is in exactly the same form that we described our angular momentum of the rotating part of the gyroscope. Euler's equations tell us that this (torque) Moment (horizontally, along that "hinge line", due to the action of gravity) is precisely identical to the CHANGE in the vector that describes the gyroscope's angular momentum. It is in that direction, horizontally sideways to the gyroscope's angular momentum spin vector. (Getting too complicated? Sorry!) This makes the gyroscope's angular momentum get shifted toward that direction, which is what precession is. In our one second interval of applying that perturbing force of gravity, we have caused a sideways vector (along 2) (of 0.01176) to be added to the original vector describing the angular momentum (0.06, and in a direction along the shaft, along 1). These two vectors are at right angles to each other, and we can quickly determine the resultant vector (like the hypotenuse) that will now describe the rotational inertia. It will still be horizontal and level, but its direction will have changed. The axis of rotation will have changed, which acts to move the gyroscope around its support point. In our case, the one-second change was 0.01176 sideways addition to an original vector that had an amplitude of 0.06. Using the tangent of that angle, we easily discover that the shaft had to turn about 11.1 degrees horizontally during that second. This particular gyroscope would therefore take about 32.5 seconds to revolve a full circle of 360 degrees, so it would have fairly slow precession. For the sake of argument and clarity, we picked an interval of one second. In reality, we would pick an infinitely small interval and Integrate the results over that second or whatever interval we might consider. The important point here is that the new sideways vector does NOT change the magnitude of the vector that describes the angular momentum but just changes its direction. The gyroscope spin rate would therefore not be affected by this effect. Notice also that, after friction of the bearings has slowed the gyroscope rotor from 12,000 rpm to half that (6,000 rpm), there is an interesting result. The sideways vector is still 0.01176, because it is due to the torque moment due to the weight of the gyroscope and the force of the Earth's gravity. But the vector that describes the angular momentum, still in a direction along the shaft, is now only half as large, at 0.03. Doing the vector addition now gives a change of direction in that one second of around 21.4 degrees, so the gyroscope will now take only 16.8 seconds to complete an orbit, instead of the earlier 32.5 seconds. This explains another characteristic that everyone has seen with gyroscopes and tops. As bearing friction makes their rotation slow down, they start "wobbling" faster and faster. Now you know why that happens! I can pretty much guarantee that you have NEVER even MET anyone who could actually explain why a slowing top or gyroscope INCREASES in precessing speed as the rotor slows down! But now YOU could explain this odd fact to strangers you meet on the street! IF someone GUESSES at why it happens (like adults do when their kids ask about this), their guess is usually that the spin energy of the gyro rotor is getting transferred to the precessional motion. An interesting guess, but totally wrong! The gyro rotor ONLY slows down due to air friction and the friction of its shaft bearings, and so the energy it loses in slowing down simply goes into heating up the air around it (a tiny bit) and the metal near its bearings! We will discuss (far) below just WHERE the energy for the precessional movement comes from, and THAT is actually also the source of the NEW additional kinetic energy as the precession first speeds up. Nice try, parents, but no cigar! With the above approach, you should now be able to calculate a prediction for how fast any toy gyroscope will precess when placed horizontally on its pedestal. You could even work backwards and use the timed precession rate to determine the rate the gyro rotor must be spinning! If it is placed at any angle, all of the theory described is still true, but the mathematics gets more complicated. The simplifications mentioned earlier to Euler's equation would not apply, since the Vector product then involves a variety of angle terms. 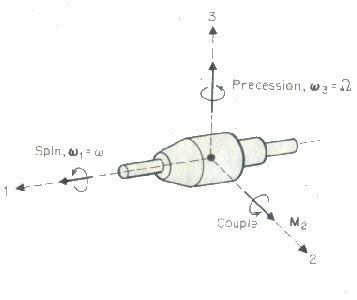 Actually, for this rather simple configuration, as discussed earlier, Euler's equations simplify into: M = I * ω * Ω, where M is the perturbing torque moment, I is the moment of inertia of the spinning part, ω is the rate of spin of the spinning part, and Ω is the rate of precession. But we have already calculated what M and I * ω are! Therefore, for our example, we have 0.01176 nt-m = 4.8 * 10-5 kg-m2 * 1256/sec * Ω. This solves to 0.1951 radians/second, which gives a period for the precession of 32.2 seconds, in fairly good agreement with our earlier rough calculation. This value is technically the correct one! I propose a slightly modified description of gyroscope motion. As in all popular discussions of gyroscopes, the discussion above has effectively ignored the first of the two newly created forces, the one that counter-balances the perturbative force of gravity and keeps the horizontal gyroscope from falling. The following modification includes consideration of this aspect. This composite force vector is perpendicular to the axis of the rotor's rotation, but has components along the two other axes we have been discussing, the vertical and the forward. The vertical component is always exactly identical to the downward force of gravity due to the weight of the gyroscope in the Earth's gravity, which keeps it from falling. The forward component is the precession-causing component we have been discussing. This, therefore, does not change anything in the discussion above. But it allows the addition of another insight into gyroscopes. As a gyroscope slows down as a result of friction, its angular momentum continually lessens, while the gravitationally caused downward moment stays constant. The upward component must similarly remain constant, which keeps the gyroscope from falling. As the right hand term above therefore becomes larger due to frictional slowing, so must the left term. This then has the effect already noted of increasing the forward component as the gyroscope slows, which increases the precession rate. (The cross product of the relationship above remains constant: as the angular momentum lessens, the forward component must equally increase). But this new perspective DOES add one new insight. As the angular momentum of the gyroscope becomes less, at some point, it becomes so low as to require an extremely high precession rate to maintain this relationship. Therefore, it becomes too low to maintain the relationship just presented. At that point, the gyroscope is no longer capable of counter-acting the force of gravity and the gyroscope suddenly falls. This relationship allows an analysis to determine when that sudden breakdown will occur. This fact indicates that the above relationship is not actually an equality but a meta-stable equality that is only true when the gyroscope's angular momentum is greater than a certain amount. Experimental study might be appropriate to determine the point at which the meta-stability breaks down. For example, it might come at a point when the (horizontal) precessional component of the force vector is equal to the (necessarily constant) vertical component. Whatever circumstance would be found regarding the breakdown of the meta-stability, seems likely to apply generally to all (horizontal) gyroscopes. It seems likely that a thorough study of the Euler equations and their solution probably contains the mathematical proof of that situation. When ancient people looked at the stars at night, they saw a different "Pole Star" than the Polaris that we have today as our Pole Star. Even the ancient Greeks (specifically Hipparchus) had noticed this slowly changing effect. It was such a slow effect that he didn't SEE it, but rather, he noticed that drawings of star locations which were made generations before him showed clearly different positions of the stars! Of course, at that time they didn't realize that the Earth moved or that it went around the Sun, so they didn't have any analysis or explanation for what they were recording. Eventually, (after it was accepted around 1500 AD that the Earth rotates and moves around the Sun!) it was realized that the fact that the Earth's spin axis is significantly TILTED (which causes our Seasons), caused a situation where the Earth's motion represented an effect apparently resembling that of a child's top or gyroscope. The CAUSE of this effect is not quite the same as for a toy gyroscope on the Earth's surface. The premise is that the earth is a giant gyroscope which is affected by each of the Sun and Moon, and which therefore has a period for the precessional "wobble" of (currently) about 25,800 years. Since the motion of the Earth seems so similar to that of a gyroscope, it seems that it has been assumed that the same mechanism is at work. That is only a partially correct assumption! It is certainly another application of Euler's equations, and very closely related, but different. I think that using the same term, precession, to describe the action of a gyroscope and the Earth's motion, may be technically incorrect, and definitely somewhat misleading. Even though they LOOK to be the same, they are actually somewhat OPPOSITE! A child's gyroscope is affected by the outside effect (gravity) where the gyroscope tries to FALL OVER. The Earth is affected by the outside effect(s) (the separate gravitation of the Sun and Moon, when either or both are OUT of the plane of the rotation of the Earth) where the Earth tries to STAND UP straighter! If the Earth were perfectly spherical and uniform, there would be no precession at all! It only occurs BECAUSE the Earth has an equatorial bulge, that is, the Earth is deformed due to its rapid spinning. In that sense, the Earth contains a gyroscopic ring of mass which rotates. It is pretty accurately known that the entire Earth has a moment of inertia of about 8.070 * 1037 kg-m2. But this number has no direct value in analyzing the precessional movement of the Earth! Because the Earth spins fairly fast on its axis, once every day, where locations on the Equator are rotating at over 1,000 miles per hour, the actual shape of the Earth is not precisely a sphere but it is slightly deformed. We sometimes say that the Earth is "flattened" at the Poles. There are a lot of complex ways of describing and explaining this flattening (technically called Oblateness) but we will just accept it as a fact here. Effectively, for our purposes here, we can look at the Earth as being a composite of two different (spinning) objects. The first is a perfectly spherical planet, with a diameter of the Polar diameter (around 7899 miles [12,713 km]). This object, being spherical, has NO significance regarding any precession effects. The second component is an extra 'belt' of material, with a maximum thickness of around 13 miles (21.4 km), around its middle, that accounts for the Equatorial diameter of 7926 miles (12,756 km). This "belt" somewhat resembles a very distorted "donut" of material has its maximum thickness at the Equator, and tapers off in thickness both to the north and south. The significant fact here is that ONLY THE BELT represents an equivalent to our toy gyroscope. We will estimate that the total mass of this belt of material to be 4.16 * 1018 kilograms, and that the belt of material is estimated to have an effective moment of inertia (I) of about 3.3 * 1035 kg-m2, about 1/250 that of the whole Earth. Now just think about the NEAREST part of the belt to the Sun (on that day). The Sun's gravity would be pulling it, of course. The Sun is also gravitationally attracting the body of the Earth, but the center of the Earth is FARTHER from the Sun than the near part of the Belt is. It is simpler to understand this if you think about ACCELERATIONS rather than total FORCES! (The reasoning which explains WHY there is a tidal bulge in the oceans on the BACK SIDE of the Earth is also clearest if accelerations are considered instead of gross forces, for the Earth center being CLOSER to the Moon than the rear side tidal bulge is, means that the Moon ACCELERATES the Earth body toward it with a greater acceleration than it pulls that rear side bulge!) Here, regarding the part of the equatorial Belt is on the OPPOSITE side from the Sun is NOT accelerated toward the Sun as much as the main body of the Earth is. This results in the FARTHEST part of the Belt ALSO causing the same effect of trying to stand the Earth's rotation up more than it is! Getting back to the NEAREST part of the Equatorial Belt, ON the June 21 Summer Solstice, we see that the force of the Sun's gravitation is at an upward angle (of 23.45°:, so it has a component which is along the Z-axis (vertical, or somewhat north-south). In fact, we can put some numbers in here now. Using Newton's standard equation for gravitation, we can quickly calculate that the SUN-NEAR part of the Equatorial Belt is accelerated at 0.005914 m/sec2. Knowing that the Sun's pull is then at that 23.45° angle, we can then use the sine of that angle to learn that the Belt then has a Z-axis acceleration component of 0.002364 m/sec2. We can then multiply by the ARM of this acceleration and also by the (total) mass of the Belt at that location, to determine the Moment (torque) which would then apply to try to tilt the Earth's rotation. IF we assumed that the ENTIRE mass of the Belt was at that location of greatest angle, then we would have a net Moment of 5.75 * 1022 nt-m. We actually need to mathematically Integrate the effects of all the parts of the Equatorial Belt, which turns out to give a total effect for the Moment on June 21, due to the Sun, as 2.87 * 1022 nt-m. The important part here is that the Z-axis part of that pull of the Sun on the Earth's belt would be pulling THAT PART of the belt, not only TOWARD the Sun as we expect, but ALSO UPWARD. This would have the effect TOWARD flattening the tilt position of the belt out (or of causing the Earth's rotational axis to stand up more vertically). We now have a situation where there is a TORQUE applied to the Belt of the Earth, as compared to the center of the Earth. The NEARER part of the belt, is now as LOW as it can seem to the Sun. So the "flattening" effect is the greatest it can be. It turns out that there is a nearly identical effect regarding the FARTHEST portion of the Belt. In that case, the Earth center is closer to the Sun than the FARTHEST portion of the belt of material, or equivalently, to again stand the Earth's spin axis up more vertically. In case this was too confusing, the important part is that Sun's gravitational effect on the belt (on that day) would have the effect of creating a Moment (or torque) that would be trying to tilt the Earth's belt axis toward being more upright. The fact that the belt is rigidly attached to the rest of the Earth means this same effect occurs to the entire Earth. The technical name for the tilt of the Earth's axis is the Obliquity of the Ecliptic. If you followed this, you might want to think through what happens at December 21, the Winter Solstice. You should find that, again, the net effect is to try to cause the Earth's axis to become more vertical. This effect of the Sun is therefore the same whether the Sun is looking at the top or the bottom of the equatorial belt. Even though Summer and Winter have the Sun looking at opposite sides of our Equatorial belt, the effect turns out to be the same, where both have the effect of trying to cause the Earth's axis to become more vertical. So we have NO precession around March 21, a MAXIMUM around June 21, NONE again around September 21 and MAXIMUM again around December 21! It is NOT a constant effect like everyone has always told you! OK. This is SOMEWHAT like a child's gyroscope, but with two major differences. (1) Where gravity on a toy gyroscope is trying to INCREASE the tilt angle of the axis with vertical (make it fall over), the situation with the Sun and the equatorial belt of the Earth is trying to do the opposite, to stand the Earth up straighter! (But both are applying a Moment (torque) to try to tilt the axis, which is actually the important part!) And (2), the precession effect of the Sun is NOT CONSTANT! Every year, it completely stops at March 21 and September 21 (when the Sun is directly over the Equator and the belt) and becomes maximum on June 21 and December 21. When people speak of the precession of the Earth, they usually ASSUME that it is a CONSTANT process! They probably don't realize that they are actually talking about an AVERAGE rate, because it is constantly changing like crazy! We have been discussing the effect of the Sun, but the Moon also has essentially identical effects. The Moon's motion is extremely complex and there are other (small) variations in the rate of precession due to the Moon. The Moon revolves around the Earth each month, and it is much closer to us than the Sun is. Even though the Moon is far less massive than the Sun, the gravitational effects regarding Precession are actually greater due to the Moon than due to the Sun (as calculated below). AND they change even faster, with the two maxima and two minima every 29.5 days! The analysis of the Precession due to the Moon is more complicated, for several reasons. The Moon's orbit is tilted several degrees from the Ecliptic, its orbit is rather elliptic (the Moon coming nearer and going farther from us every single month), and worse, the plane of that orbit constantly Regresses in an action similar to precession, in a period of around 19 years. This variation on the orientation of the Moon's orbit sometimes enhances the Sun's Precessional effect and sometimes fights it, so there is a prominent variation of total precession in around a 19-year period, one of the effects which are collectively called Nutation. I hope you can see why I am a little bothered by using the same word, Precession, to describe a gyroscope's (constant, fall-over) motion and the Earth's (herky-jerky, stand-up) motion. But, yes, they certainly have many similarities, especially the end effect of the wobble! Because the Moon has so many other effects involved, our calculations here will focus on the Sun and its precessional effects. The Moon is analyzed in the same way, but the mathematics is far more involved, and we feel it would be distracting here. The magnitude of the Sun-sourced force vector (and Moment) must be calculated in the same manner as for the gyroscope. The Earth's total moment of inertia (I) is 8.07 * 1037. We have also discussed above that the estimated moment of inertia of the Earth's equatorial belt (Ib) is about 3.3 * 1035. Any torque (or Moment) applied to the (belt or whole) Earth has to act on the whole solid Earth. The Earth's daily rotation rate ω is 7.292 * 10-5 radians per second, so the magnitude of the Earth's angular momentum vector (H) is the product of the TOTAL Moment of Inertia of the Earth times that rotation rate, or 5.866 * 1033 kg-m2/sec or nt-m-sec. The mass and distance of the Sun are known, and so is the 23.45° angle of the tilt of the Earth's axis. It is possible to calculate the Moment/torque effect of the gravitational attraction of the Sun on the Equatorial BELT at any instant, since it is basically only dependent on the distance involved and the angle of the tilt at that instant. We know that it is ZERO around March 21 or September 21! It is pretty easy to calculate the instantaneous Torque on June 21 for the tiny part of the equatorial belt directly under the Sun and that part exactly opposite. It represents about 5.76 * 1022 nt-m. One must mathematically Integrate the Moment effect over the entire belt and over an entire year (fairly easy Calculus) to get the net annual average torque effect due to the Sun as being 1.44 * 1022 nt-m.
We then have an (average) Moment (torque) applied of 1.44 * 1022 nt-m. This is the dH/dt of far above! H is the 5.866 * 1033 nt-m-sec we just calculated. In the same was as we did with the toy gyroscope, we can now determine how great the effect is. The quotient of this is 2.45 * 10-12 radians/second. This is the same as a Precession rate of 15.94" arc-seconds per year. Note that we have ONLY considered the Sun, and resulted in a precession effect on the Earth, completely due to the Earth's non-spherical shape (due to the Earth spinning on its axis) and its effect of creating a belt around the Equator. The Moon does NOT even need to exist for this Precession to occur! However, this precession due to only the Sun (the 15.94 arc-seconds per year) would mean that the Earth would precess entirely around in (360 degrees divided by 15.94 arc-seconds per year or) 81,300 years, much more slowly than we know that it actually does! By the way, we have simplified these calculations here to not include the effects of the varying distance of the Earth to the Sun due to its elliptical orbit, or that that ellipticity is even slowly changing! It turns out that if we ONLY consider the Moon, using entirely different numbers but essentially the same logic, we get another precessional effect on the Earth. The Moon's orbit is tilted from the Earth's equator (and also has another 5° of orbital inclination from the Ecliptic) and so all the same stuff applies. The Moon is much less massive than the Sun, but it is also much closer. The calculations (like above) give us an average monthly average torque as 3.1 * 1022 nt-m, slightly more than double the effect of the Sun. With all the exact same calculations as above, we get a result that if only the Moon were causing precession, the Earth would precess entirely around in (360 degrees divided by 34.45 arc-seconds per year or) 37,600 years, or alternately, we can say that the Moon causes an annual precession of 34.45 arc-seconds. The Moon's orbit is not very circular (it has eccentricity, and that eccentricity has constant changes of its own!) and so the calculations depend on where the Moon is in its orbit, so the math is much more complicated, but otherwise the same. By the way, the fact that the Moon has these effects far more rapidly than the Sun does, every few days, and it is also of around twice the net power effect, our associated presentation regarding the Violation of the Conservation of Angular Momentum includes the calculations which show that an average of around 63 million kiloWatts of power is being transferred into or out of the Earth's Lunar-driven Precessional motion! This average of 63,000 Megawatts is comparable to ALL the electrical power generated by MOST of the US Nuclear-powered electric powerplants. I do not see any possible way that we humans could ever accomplish where we might ever capture any of that power, but it is certainly an intriguing thought! Notice again that even if someone figures out how to capture that energy and power some day, there are tremendous fluctuations regarding how much power is involved! As the Moon crosses the plane of the Earth's equator (twice each month! ), there is NO Moon-driven precessional effect at that instant. But a week later, when the Moon is at the greatest angle from the Earth's Equator, there is at least 126,000 MegaWatts of power then being transferred to the Earth's motion! It causes a WOBBLE that is generally considered to be one of the many Nutations of the Earth. The Earth is so massive that even such enormous power only causes a few feet of movement of the Poles! Even though that is an unbelievably huge amount of power which exists, its great variability might mean that modern society and business may not even want it! Scientists generally refer to a Luni-Solar Precession, which is the total effect of these two (which are both AVERAGES), the 15.94 arc-seconds per year due to the Sun and the 34.45 arc-seconds per year due to the Moon, or a net AVERAGE total effect of 50.39 arc-seconds per year. This presentation provides the math and logic to show that such AVERAGE values for Precession is actually inaccurate. Interestingly, these repetitive errors have long been detected and measured, and without any proper analysis or explanation, they have been lumped into a group of assorted Earth behaviors called Nutations! The Earth has quite a large number of minor motions which are not individually analyzed and therefore lumped together under the Nutation descriptor. We have presented here the logic and math which shows that the actual explanation of at least some of those Nutations are actually just STANDARD variations of Precessional effects. Specifically, there is a large Nutation term which has a period of 29.5 days, and another which has a period of exactly half a year. You now KNOW where those two terms actually come from, as being NATURAL variations in the Precession process! This is interesting in that tables and charts do NOT ever show really precise values for many of the smaller motions of the Earth, but with proper approach, as indicated here, extremely precise values and predictions of such Nutational motions are certainly available. It apparently only remains for someone to actually APPLY these more analytical approaches to present better charts and tables. In this regard, I now present several graphs. All of these eight graphs have a vertical scale of 'arc-seconds per year' with all but the third graph having a scale of 10 arc-sec/year per interval. The third graph has a scale of 3 arc-sec/year, to better show the detail if the wiggles in the overall line, as the line looks nearly straight with fairly small wiggles otherwise. The first two are the straight-line graphs of the traditional assumption, where Precession supposedly proceeds at an absolutely constant rate, the first of these two showing the PROGRESS of Precession during a year (starting at 0.00 and ending at 50.39 arc-seconds) and the second showing the flat line that represents the RATE of that Precession (the Differential of the first graph). Next are the same two graphs which are ACTUALLY the case due to just the Sun. Remember that this upper graph has a different vertical scale to better show the wiggles, as it goes from 0.00 to 15.94 arc-sec during the year. Note that the RATE (shown as a blue-green line) drops to exactly zero as the Sun crosses the Earth's Equatorial Plane at the two Equinoxes, and it is POSITIVE at all other times, being maximum at the two Solstices. We include a horizontal line which shows the ANNUAL AVERAGE Solar Precession (the 15.94 value). The PROGRESS of Solar Precession is not that different from the usual assumption, but we can see that the SLOPE becomes zero at the Equinoxes and becomes greatest at the Solstices. The net ERROR on any day is clearly noticeable, but for most purposes, rarely more than one arc-second and therefore small enough to usually be neglected. Next are the two graphs showing Lunar Precession. We show this on the normal scale of the rest of these graphs, where the twenty-five wiggles in the angled line are barely noticeable. We can see that the average rate of Lunar Precession (34.45 arc-sec/year) is more than double that of Solar Precession, but also that it is constantly changing, as the Moon passes through the Earth's Equatorial Plane around 25 times every year! We can again see that the ANNUAL AVERAGE (red horizontal line) is the value which has traditionally been described. We also see from the PROGRESS graph that even though the Lunar effects are so strong, they start and stop so often that the wiggles in the PROGRESS graph are barely noticeable, and that the error on any day rarely exceeds one-arc-second. Finally, we combine the two actual Precession graphs into a reasonably accurate graph of the Luni-Solar Precession of the Earth during a year. This particular graph is based on an assumption that the Moon passed through the Earth's Equatorial Plane at midnight on New Year's Day, and in general, the Lunar graph will be horizontally offset slightly for any given real year. Notice how wildly the instantaneous rate of the Earth's Precession is constantly changing, as made clear by the RATE graph. (vertical range for this graph goes to over 100 arc-seconds/year). The difference from the first of these graphs has long been detected and measured, but it was apparently never realized that the wiggles were actually due to natural effects of the Precession processes. Instead, those wiggles have always (incorrectly) been lumped in with a lot of Nutation effects. The assumption that the Luni-Solar Precesion graph would be a simple slanted straight line, which would rise by 50.39 arc-seconds over the year, IS a crude approximation of the reality, but you can see here that the actual amount of precession on any given day is NOT exactly the value given by that linear straight line. If you are an amateur astronomer (or even a professional one), you use star charts which show exact positions of objects on 2000.0, and then you make a (LINEAR) correction to adjust for the precessional effect which has occurred after 2000.0. In general, that resultant value is close enough to the ACTUAL precessional shift that you still will see the object you are seeking. But it actually is nearly always off-center of your field of view, and THIS is the explanation for why that happens. IF you (or a computer) would determine the ACTUAL precessional shift UP TO THAT SPECIFIC NIGHT, then you would find your desired object exactly in the center of your field-of-view. Probably not a big deal for most people, but for a Theoretical Physicist, this IS a big deal! Most people probably either think their star chart was not precise enough or they blame it on Nutation and forget about it! All this has been presented to remind you that the ACTUAL precessing effect at any instant is dependent on a huge number of variables, and that the normal simple reference to "precession" is really just a long-term average of a lot of complex effects! There are actually close to 200 different effects which are collectively called Nutation! Roughly half of those are due to the Sun or Moon and the other half are due to effects of the other planets and some of their moons. Only some of them due to the Sun and Moon are very large in effect. The four which have largest effects are (1) due to Regression of the Nodes of the Moon's orbit, 18.6 years; (2) due to the alteration of Solar Precession, 182.6 days or half a year; (3) due to the alteration of Lunar Precession, half a month; and (4) the revolution of the Moon's perigee, 9.3 years. You learned above about (2) and (3) and even how to calculate their effects! The Sun's principal effect is called Solar Nutation and is a maximum of around 1.2" of longitude (different from what a constant precession would have caused). It turns out that the on-off precession effects, which are caused by the Sun trying to flatten out the Earth's equatorial plane and stand up our axis of rotation, remember, also have a brief effect at accomplishing that. So the tilt of the Earth's axis is also slightly (temporarily) affected by Solar Nutation. The effect of these two things is that if we carefully tracked the exact axis of the Earth's rotation, it has a really tiny (around 1.2" of arc) effect. This causes the Earth's axis to shift by around 120 feet, in essentially a poor circle, twice each year! You probably already guessed that there is also Lunar Nutation, due to the "inequality" of the variations in the precession due to the Moon. In the same way that lunar Precession has a greater effect than solar Precession, so does Lunar Nutation. Lunar Nutation has a maximum effect of around 17.2" of arc. Where Solar Nutation repeats about twice each year, Lunar Nutation repeats about twice every month! The combination of these two Nutation effects can therefore have a maximum of around 18.4" of arc of effect. This is usually described as a 9.2025" Nutation which can be either positive or negative from the calculated precession position, mostly for the simplicity of calculations. Of course, since the Moon has a rather elliptic orbit, and that orbit is constantly evolving, such as by Regression of the Nodes, the lunar effect actually varies to some extent. The full calculations are horrendously complex. (Which accounts for all the separate effects which are lumped into Nutation!) In fact, during the 1960s, when the US Government had committed to landing a man on the Moon, the available calculations were pretty terrible, and many scientists worried about whether the Moon would actually be at the location where the spacecraft would try to land! The combination of these Nutation effects is that the Poles of the Earth Nutate around the "average" axis of rotation in a small wavy somewhat circular path. Interestingly, the ACTUAL axis of rotation on any day is NEVER exactly at the place that we call the North Pole, but somewhere on that wavy circle around 900 feet away from it! For maps, we must use a specific location, and so the average location of the axis is identified and used. This brings up an interesting point! Since, on any given day, the ACTUAL "North Pole" (the actual axis of the Earth's rotation on that day) is around 900 feet away, and moving nearly a foot an hour, the reality might easily be that NO ONE has yet actually been to the "real" North or South Pole! When explorers go to the North or South Pole, they probably do not get even very close to the ACTUAL axis of rotation ON THAT DAY, AT THAT MINUTE, and instead plant their flag at the point of the AVERAGE location of it (where a map shows it to be! ), more than a city block away! These effects are generally pretty small, and VERY slow, so there is no reason to get excited over them! But in the constant pursuit of science to achieve ever and ever more accurate data and info, these things are studied and researched. We are NOT going to discuss here the reasons for the many wiggles in this graph, except to say that the discussion above actually provides all the necessary info and even the equations. The scale on the left shows the SIZE of the variations away from an average value of around 50.27" of arc per year. This graph is from Milankovitch from around 80 years ago which shows the variations in Precession over the past 800,000 years (KYR BP means thousand years before present). You probably have noticed that Milankovitch considered 50.27 arc-seconds per year as his horizontal axis, which confirms that our current (average) rate is now around 50.29 arc-seconds per year, and that it is currently increasing (toward the left in his graph). For your curiosity as to how we can know these effects which are so amazingly slow, as there were no astronomers around to observe them, the answer is in a field called Fourier Analysis. If EXTREMELY accurate data is taken for a modest period of time (like a century), that data contains many tiny irregularities in it. Various Mathematicians during the 19th Century, including Fourier, discovered that ANY graph, no matter how complex, can be represented by a collection of simple sine wave components, of various frequencies and amplitudes. The Calculus to do this for actual data is not that difficult. As a result, we can see (mathematical) effects of the gravitation of each of the four Galilean Moons of Jupiter on our Moon's orbit and also on the Earth's motions. The frequency of that Fourier component identifies which object is gravitationally causing the effect, and the amplitude of that sine wave component tells us how strong the effect is. In the case of some effect such as precession, modern astronomy has gathered enough accurate data to be able to extrapolate several sine-wave-shape curves to produce such graphs which are certainly quite accurate, for many thousand years either forward or backwards! This is a far more accurate and more recent graph from Lasker (1986 and 1993) It has a smaller scale of only 100,000 years both in the past and in the future. It is drawn in the opposite direction of the graph immediately above it. Such graphs are possible because of a mathematical procedure called the Fourier Transform, where extremely precise data can be analyzed for virtually invisible very long-term patterns. A different subject! A Clear Violation of the Conservation of Angular Momentum! When a gyroscope is placed on a pedestal and released, it initially is NOT Precessing! It has NO (kinetic) energy of the precessional motion which will develop. When it is released, it quickly ACCELERATES up to the precession rate. I have never seen anyone describe where that (Kinetic) energy comes from! Due to Conservation of Energy, it obviously must come from somewhere! If we (Vector) Integrate both terms over the time interval of the precession acceleration, we wind up with terms which include ω3 (the actual final precessional rate) and θ2 (a change of angle of the tilt of the gyro axis). Think about exactly what this means. The body of the gyroscope SINKS some distance (in the Earth's gravitational field) which therefore GIVES UP an amount of POTENTIAL ENERGY. THIS is our source for the energy that becomes the Kinetic energy of the Precession motion. This result, of the mathematical Integration of the Euler Equation(s), clearly is extremely important to science, because of its many consequences, but as far as I know, it has never even been noticed before! We therefore can calculate the TOTAL amount of Kinetic energy which is in the precession motion, and know that that amount is EXACTLY the same as the amount of Potential energy which was lost. Therefore, we can calculate exactly how far down the gyroscope body must drop to keep Conservation of Energy true! If we consider the example toy gyro discussed above, we have the necessary numbers. We had calculated that I3 = 4.8 * 10-5 kg-m2. We also calculated how fast the precession acts, ω3 = 0.1785 radians/second (in the form needed here). In rotary motion, the Kinetic Energy of Precession is given by 1/2 * I3 * ω32. For our example gyro, this results in 7.65 * 10-7 nt-meter (or joule) (the Kinetic Energy required to appear for the precessional motion). In order for this energy to come from somewhere, and we just learned that it comes from potential energy in the gravitational field, this amount of energy must then exactly equal the Potential energy given by m * g * Δh (where the differential distance is the change in height in the gravitational field) . We learned above that m * g is 2.94 nt. Therefore we have Δh = 7.65 * 10-7 nt-meter / 2.94 nt. This is therefore 0.00026 millimeter that the body of the gyroscope had to drop in order to release the necessary amount of Potential Energy to allow the precessional motion to begin! This is REQUIRED in order to obey the Conservation of Energy. This indicates that the gyroscope drops down a tiny fraction of a degree while the precession accelerates up to speed. (This represents around 0.00026 millimeter, a distance that would be nearly impossible to notice, nearly being on the atomic scale!) The precessional kinetic energy which appears in our toy gyroscope is about three-fourths of one one-millionth of a joule, which is necessarily the same as the amount of potential energy that was released as the gyroscope dropped that tiny fraction of a millimeter, in an example of Conservation of Energy. If you think about it, we discussed another detail above that should trouble you! We said that the precession SPEEDS UP as air friction and bearing friction slows down the rotor speed. But you should now see that the NEW kinetic energy of the faster precessional motion also comes from an additional slight falling of the body of the gyro (or top). There is NO connection between the (frictional) energy lost as the gyro rotor slows and the increase in the precessional kinetic energy! You are now even in a position to calculate just how much further it drops down as the precession is speeding up, which means that Conservation of Energy continues to be true! So even though the precessional motion appears to begin without any source of energy, it actually has a source in the potential energy in the vertical axis (in the gravitational field). However, Conservation of Angular Momentum IS violated, where it is always true otherwise. Conservation of Angular Momentum has been a trusted law of science for more than 150 years, but here is a situation where it is not true! As the precessional motion begins, angular momentum "appears" (around axis 3) where it had not existed before. This is a unique situation in the field of Physics! The same violation occurs when planets perturb each other, which is also a gyroscopic effect, and that actually changes a rigidly held believe of Physicists! They believe that when two planets perturb each other, that they cannot alter the semi-major axes of their orbits. That WOULD be true, and is easily shown by simply examining the equations for both energy and angular momentum. So, for more than 150 years, all astronomers, astrophysicists and physicists have concluded that perturbations could not affect the orbital radii of planets and other objects. The fact that this proof above shows that GYROSCOPIC effects CAN permit such changes is an enormous change in the field of astrophysics! It actually allows a rather simple explanation for a number of peculiar things in the Solar System, such as (Kirkwood) gaps in the asteroid belt, gaps in the rings of Saturn and other planets, interesting patterns in the four Galilean Moons of Jupiter and many others, and even the Long Inequality of Jupiter and Saturn! But Astrophysicists seem to still deny that this Violation of the Conservation of Angular Momentum occurs due to gyroscopic effects, so they still insist on some wrong assumptions! We know that the Moment which applies to trying to make the gyro fall is 0.01176 nt-m (each second). So we have 7.65 * 10-7 nt-meter / 1.176 * 10-2 nt-meter/sec which would give less than a ten-thousandth of a second! Of course, we could also calculate the time that gravity would take to have that weight fall the 0.00026 millimeter. d = 1/2 * g * t2, so we have t2 = 2.6 * 10-7 meter * 2 / 9.8 meter / sec-2. t2 = 5.3 * 10-8sec2. This also results in around a ten-thousandth of a second! Oh, in the case of planets or moons, the effects are rather subtle! Hundreds of thousands or millions of orbits are required before the effects are really obvious. The math shows WHY that is the case! This last subject turn out to have immense importance in science! The very fact that every toy gyroscope ever released got up to full precessional speed "instantly", apparently caused early scientists to not even realize that there was any issue regarding where that precessional energy and angular momentum came from. So it does not appear that anyone had ever noticed before that this is a example of a VIOLATION of Conservation of Angular Momentum! As a result, several assumptions had been made in science which can now be seen as having been wrong! A primary wrong assumption was made in the middle 1800s when several brilliant mathematicians assumed AM was always conserved, which therefore required that planets could perturb each others' orbits but NOT the actual orbital radius. That assumption was repeatedly built upon many times over the following 150 years, where quite a few errors in science were built up and which now still exist. It turns out that there are now simple and obvious explanations for many things that no one has ever tried to explain! Like the amazing relationship between the orbits of the four giant moons of Jupiter, where their orbital periods are amazingly related. Also, Jupiter and Saturn have a Long Inequality which is the same. Similarly, Saturn's rings have gaps in very specific places. The asteroid belt around the Sun has Kirkwood Gaps that were first noticed 150 years ago. And on and on. Those phenomena could NOT be explained when the assumption of C of MA was rigidly believed, but they become relatively obvious CONSEQUENCES when this Violation of C of MA is applied! It is now not only possible to tolerate such phenomena, but to actually CALCULATE them! The same situation is necessarily true in Atomic Physics regarding the amazingly consistent orbits of electrons around atoms. During the 1930s, they were seen thus as it was ASSUMED that there were EXCLUDED orbits (Pauli and others)! In fact, that was then later built upon to create the entire field of Quantum Dynamics, upon which nearly all of modern Physics research is based! But when this Violation of C of MA is added to Nuclear Physics, electrons can now be seen to be able to PERTURB each other's orbits. It becomes clear that an electron could be simply tossed into any atom with any orbit whatever, and within a few million orbits (a tiny fraction of a billionth of a second), the electrons would perturb each other to APPEAR to us in the only way we ever see them! In principle, this might mean that the entire basis for the development of Quantum Dynamics might have been a wrong assumption! There seem to be even more implications of the Violation of the Conservation of Angular Momentum which are beyond imagination! You must certainly see that the fully accepted phenomenon of Planetary Precession IS an example of a Violation of the Conservation of Angular Momentum! NOT once it is in operation, but WHEN IT FIRST STARTED. Consider our tilted Earth, spinning away early in its existence. It would have to START precessing, right? But even more obviously, we know that Solar Precession is ZERO around March 21 of every year, but it BECOMES significant and a maximum around three months later, around June 21. We even SEE the herky-jerky motion of Precession which we call Nutation! We learned above that the ENERGY involved is explainable, and Conserved. But the simple fact that on March 21, the Earth has NO Solar Precessional motion, it has NO angular momentum in the Z-axis on that day. But just three months later, it has an immense amount of Z-axis angular momentum! Assorted comments have been received since this page was first placed on the Internet in 1998. I have been somewhat amazed to find that there are many people who claim that there is no such Precession motion of the Earth, that it is too slow of a process to have ever been confirmed! Wow! I have been sometimes tempted to ask if those people also believe in a "flat Earth"! Every amateur and professional astronomer is VERY aware of the effects of the precession of the Earth! It is VERY annoying! Accurate star maps are printed for a precise date, like 1950.0 or 2000.0, and the exact place in the sky that is above 90°North Latitude (our North Pole) is precisely marked. (All other stars are marked and shown relative to that location.) Unfortunately, due to the precession of the Earth, the point in the sky (stars) that is directly above the North Pole seems to MOVE! Every year, it proceeds by a little over 50" of arc. (We had calculated that exact amount up above.) That is actually a lot, roughly the entire diameter of the Moon in 40 years! Since even amateur astronomers often look at Nebula and other objects that are only around ONE second of arc in diameter, if it has moved by 50 times that far in a year since a map was printed, that's a problem! If you set a clock-drive of a telescope to a specific position in the sky, you will probably not see what you are looking for! Until you correct for the precessional effect! As a result of this, all astronomers regularly have to consult "Precession tables" which give the amount of correction that is needed for any date different from the Epoch of the starmaps they use! Except for a single day, all star maps are always wrong! And Precession it the greatest cause of that! It might seem that star maps are star maps, they never change! Pretty much, that is true, except for the effect of precession. If someone now tried to use a 1950.0 star map to find some nebula, they would probably never find it, as it would be more than a full Moon diameter away from where that map showed it to be! We might as well discuss another subject! The period that is described regarding the Earth's Precession was not just "made up"! And you can prove it yourself! Say you become an amateur astronomer, and you VERY accurately locate that point in the North sky where all the stars seem to circle around it every day. If you just put a good camera on a small telescope, and point it near where you think that point is, and make a time exposure for a whole night, all the stars will record as arcs of circles. The point you want is EXACTLY in the center of those circles! (Easy, huh?) Now, being REALLY patient, you wait exactly ONE YEAR and do it again! It will be in a noticeably different spot in the sky! It strikes me as mind-boggling that any person with a small telescope and a standard camera (and a year) can accurately determine an effect that takes over 25,000 years to occur. We humans have only known how to write for less than 5,000 years, and 'little you' can definitively determine a process that has not even close to completed itself in all the time of human civilization. See? You're smarter than you realized! By the way, 25,800 years per wobble seems pretty slow, right? But the Earth is so old that the Earth has wobbled like that around 200,000 times already! Another interesting thing is that where toy gyroscopes precess faster and faster as the rotor slows down, the opposite effect will happen to the Earth. As friction of the oceans due to the ocean tides (caused by the gravitation of the Moon and Sun) gradually slow the Earth's rotation down (around 22 seconds longer days a million years from now) the reversed action of the Earth precession effects (to try to stand the Earth straighter up) will slow down the precession. At a REALLY distant time in the future, the Earth's rotation will have slowed down to about 1/50 of what it is now (a day then will take 50 times as long as now, about seven days per year), and the Moon's rotation and revolution will be the same 50 days, the Earth and Moon will rotate and revolve together, always with the same side facing the other. At that time, the Earth's "axis of rotation" will be in the plane of the Moon's orbit. So then, no further precession could occur due to the Moon, and the Sun's precession effect will be different (and much smaller because the Earth will have a far smaller equatorial bulge) than now. This presentation was first placed on the Internet in April 1998. It has occasionally been updated since.